I’m thrilled to bring a new series to y’all this week, W-S Bloggers to Read. When I first started DTWS, there were local writers/bloggers/social media folks from Winston that were so kind. As I started interacting with them via Twitter, Facebook, or some other platform, I was so impressed by what each was doing around town. 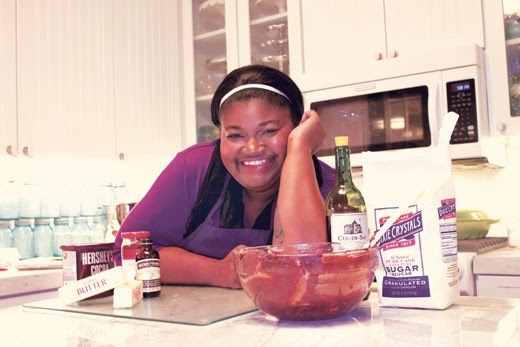 One of the friendly bloggers, podcasters, chef, and entrepreneur is Nikki Miller-Ka. When I’m pretty sure no one else was reading my twitter posts, Nikki did and she was incredibly supportive. I’m so grateful for her graceousness. As I started to think about what I wanted to bring Dashing Readers and came up with this idea, Nikki jumped to the top of my list. She is happy, delightful, and always positive. She is constantly telling her readers about something that is going on in Winston that I wasn’t aware of. Currently, I’m really enjoying video episodes for “$20 Challenge”. She has teamed up with the Dixie Classic Fair Farmers Market and the City of Winston-Salem and is feeding a family of four for $20. This is from May, 28. Who doesn’t want to feed their family a great meal, sourced locally and not break the bank? Enjoy getting to know Nikki!! DTWS: First, how did you get into blogging? Nikki: Back in 2007, I was just out of culinary school and working at the Greensboro News & Record as an editorial assistant. My job had NOTHING to do with food and I wanted to stay in touch with the food world and have a place to practice my food writing skills and share my creativity in the kitchen. DTWS: Second, you write and pod cast about food and local food theme events. What is your favorite food and which event is not to be missed and why? Nikki: My favorite food? That’s a loaded question. It changes from season to season. I’ll have to say yellow cake followed closely by succotash made with silver queen corn and butter beans. Since Winston-Salem is now a culinary destination, the new not-to-be-missed event is Salute. A week-long celebration of food and wine? The wine dinners, demonstrations, the music? What more could you want? DTWS:What gets you excited to write/speak about ? Nikki: I’m an incredibly passionate person and that passion spills over into talking about food. It’s mostly fun and games when I get to educate people about the hows and whys of food, but my most passionate subject is food insecurity in our area. Helping to feed families through volunteerism, food and monetary donations at our food banks and social agencies is near and dear to me. DTWS: Fourth, favorite item to cook? Nikki: Most cooks can’t bake and most bakers can’t cook, but I am blessed to do both well. I love to bake biscuits and cook fried chicken. DTWS: Fifth, are you competing soon? Nikki: I just recently entered and won the Southern Biscuit Flour Baking Contest, which was a surprise. Every week I look for contests I can enter and hopefully win. You’ll have to stay tuned to or subscribe to my blog’s email list so that you can find out where I’m competing next! DTWS: Final what should people know if they have never read your blog or seen your podcast? Nikki: I’m a food blogger, but I don’t do restaurant reviews. There are plenty of other blogs that do that. I use Yelp to publish my food opinions. I use Tart & Tangy Triad Podcast to talk about my food opinions and report on food happenings. I know what I’m taking about on all platforms because I’ve been in the back of the house AND the front of the house at restaurants; I’ve traveled; I’ve read; it’s my job to know what’s going on in the food world. My little corner of the world called Nik Snacks just happens to be epicenter of Winston-Salem! Here is all of her info. I’m tired just thinking about all she does. Christine! Thank you so much for the lovely post! What a sweet post about Nikki! And, what a wonderful blog you have! I’ll be back… Often!